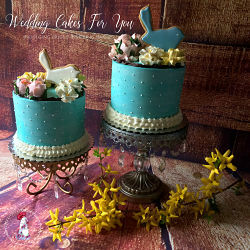 Fantasy fall wedding cakes are here! Behold the exquisite ideas here for Autumn weddings. Take a peek and if you see something you love, print it, pin it and share it. 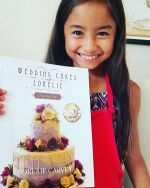 Ask your cake decorator or baker to re create one of these designs for you or Do It Yourself with some of the tutorials here on this site. 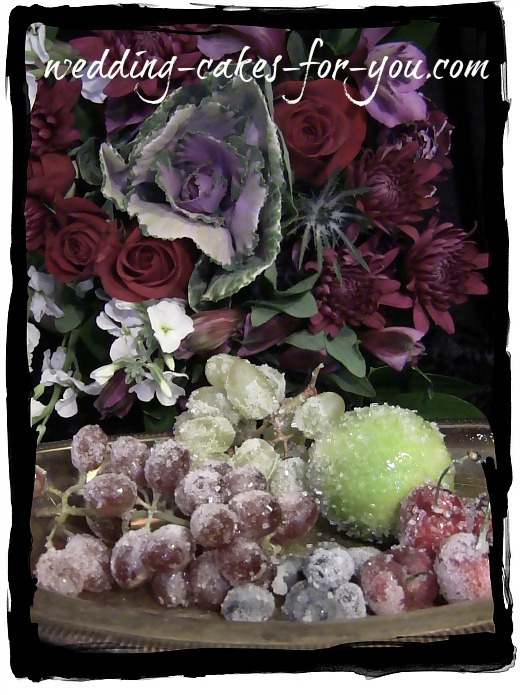 Frosting fresh fruit with sugar is one way to decorate for an Autumn or Christmas theme. I recently made this basket weave cake and adorned it in sugared fruit, one of the prettiest and easiest ways to do it yourself. I LOVE this cake!!! Buttercream is one of my favorite ways to decorate along with the freshness of real flowers. 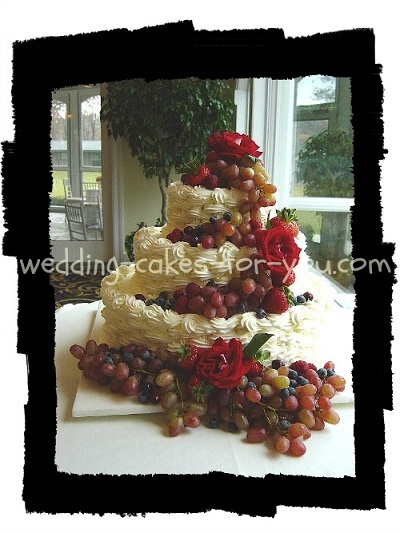 Tiny delicate grapes piped in buttercream encircling a three tiered wedding cake was the perfect design for a fall wine themed celebration at a winery. Hydrangea and fresh greens add a natural feeling to match the old barn siding at the White Silo Winery in Sherman Connecticut. 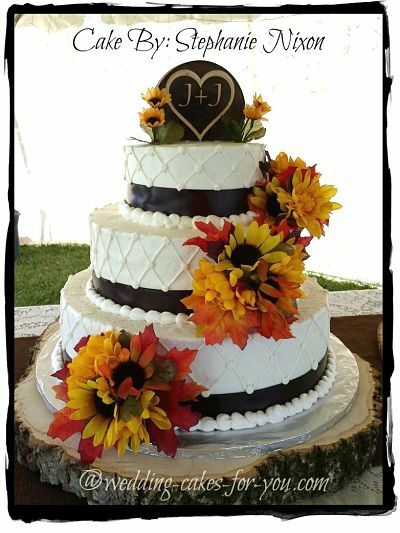 These lovely autumnal wedding confections below are relatively simple designs. The four tiered buttercream cake with ruffles gets the fall treatment with fresh colorful flowers freshly picked from the garden. 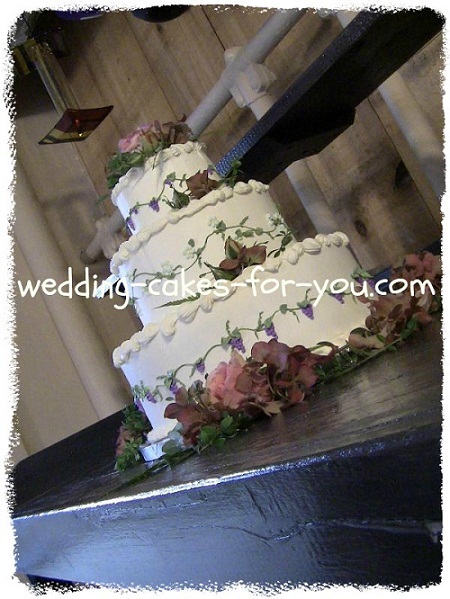 The spray on top was made using wire and tiny piped royal icing flowers in white. The idea for the spray on top was from a Wilton book. You simply pipe tiny specks of white royal icing onto white ribbon wrapped wires and hang them individually upside to dry. Once dry you just bunch them all up together and bend them for the desired effect. Basketweaved designs are easy to do. 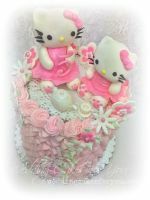 This is one of the first cake decorating techniques that cake decorating classes teach. Buttercream icing, a pastry bag, a star, shell or basket tip and a little patience with a steady hand is all you need to accomplish this. "Piece of cake"
Basket weaved in rich delicious vanilla buttercream. The classic basketweave buttercream cake is always a hit. It's beautiful to look at and delicious to taste. 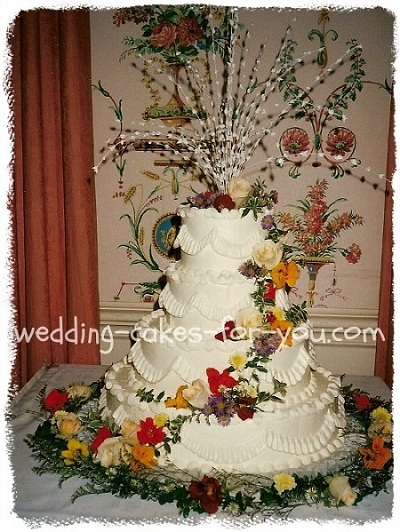 This tiered stacked cake has fresh fruit cascading down the sides and the bottom. 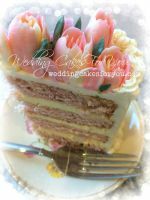 Fresh flowers are fabulous with a basket weave cake. I have done many of these over the years. 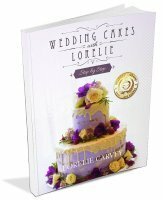 DIY brides or a beginner decorator, this is the perfect solution to a first wedding cake. Check out the fruit idea below. GREAT for Christmas themes too. Close up of the specialty frosted fruits. If you would like to see how this is done watch the video at the top of this page. I wish I had a professional picture of this cake. 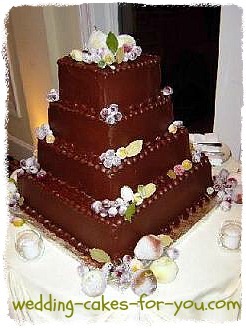 Chocolate cakes are difficult to photograph, this one especially :-( Click on the pic to see the ganache recipe. 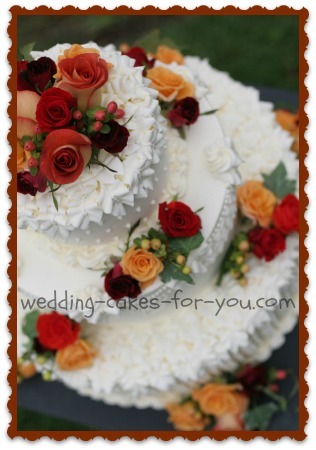 The chocolate ganache' cake with frosted fruit is a nice fall wedding flavor. I wish I had a better shot of this because it was truly amazing. The photo just doesn't capture it. The flavor was outstanding. 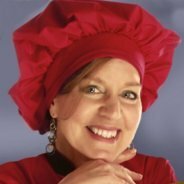 You can find the recipes here. The chocolate buttermilk cake, with ganache' filling and icing. She selected a simple yet elegant design. I had intended to make sugar flowers but she opted for artificial ones because she wanted to keep them for a wedding memorabilia project. It was a traditional white cake with vanilla buttercream frosting. This was also the biggest one I've made so far. Luckily there were some big strong guys there to get it out of the car for me. That thing sure was heavy!" A very traditional tiered cake with burgundy accents. This buttercream beauty has cornelli lace decorations piped with a small round tip. The silver cake plateau adds to the elegance of the design. 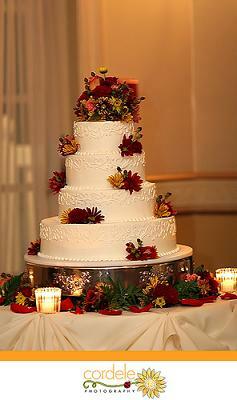 A four tiered stacked cake like this looks even more majestic sitting on top of a raised platform. The colors of the flowers give it the Autumn look.